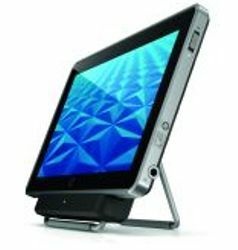 Will Canadians see HP Slate 500? Hewlett-Packard on Friday said its highly anticipated Slate 500 tablet— the company’s first such device–is now available for purchase. Targeted at businesses, the tablet will come with an 8.9-inch screen and run Microsoft’s Windows 7 Professional OS. The Slate is currently available in the U.S. for US$800, through HP’s website and channel partners. The product ships with the digital pen, a charging dock, and the portfolio. The Slate 500 was first designed as a consumer product when HP announced it in January, but the company reassessed its plans for the device after acquiring Palm for $1.2 billion in April. HP is now targeting the Slate 500 at business customers who need a handheld device and are familiar with the Windows OS and office productivity applications, said Carol Hess-Nickels, director of worldwide business notebook marketing at HP’s Personal Systems Group. HP plans to release a separate tablet for consumers with the WebOS mobile software, which was acquired from Palm. The WebOS tablet, which is yet unnamed, will be designed for activities like surfing the Web, watching movies, playing games and reading e-books, HP has said. It will be released in 2011, an HP spokesman said. The Slate 500 offers those capabilities but also is designed to connect to servers to record and pull data in real time, Hess-Nickels said. Many enterprises use Windows 7, and the device fits easily into IT infrastructures, she said. “As we talk to business customers … they’ve told us they want to have a common image all across their devices,” Hess-Nickels said. The tablet weighs about 1.5 pounds (0.68 kilograms), so users can easily carry it to record transactions or take inventory. With VPN (virtual private network) support, workers can securely connect to corporate networks. Designed for “moderate content creation,” the Slate 500 comes with multitouch and pen-input capabilities, and includes a software keyboard for data input, Hess-Nickels said. The tablet has two cameras — a 3-megapixel camera at the back and a VGA camera in the front — which could be used for videoconferencing. A Broadcom graphics accelerator offers 720p video playback. The Slate has an Intel Atom Z540 processor, which runs at a clock speed of 1.68GHz. It comes with a 64GB solid-state drive and 2GB of RAM. A USB port helps connect external storage to the device. The tablet offers about five hours of battery life and recharges in the dock. The dock includes USB and HDMI (high-definition multimedia interface) ports and a headphone jack. HP’s Slate 500 will only be available in the U.S. for now, an HP spokeswoman said. HP did not announce worldwide availability but will evaluate expanding into other markets, she said. The device will compete with other business tablets such as Cisco’s Cius, which was announced in June but has not yet shipped. Cius includes a 7-inch screen and runs on Google’s Android OS. Apple’s iPad tablet has also been adopted by some businesses.